Probably originating as string bands at the end of the eighteenth century, wind or reed bands began to find popular favour in the period following the end of the Napoleonic Wars in 1815. The earliest antecedents of the band movement may well have been the town ‘waits’, dating back to the fifteenth century, but the connection is somewhat tenuous and need not be discussed here. Military bands have much more relevance since it is known that the early bands, based on manufacturing companies such as the Clegg cotton manufacturing company and the J Foster and Son Black Dyke Mills Band, originally bought their music from military bandmasters garrisoned in such important centres as Manchester. The demobilization of military bandsmen from 1815 would have further strengthened the development and organization of bands and did not a little to influence them in the adoption of uniforms. At about this period there were a certain number of church bands in existence in various parts of the country, but they can scarcely be said to have exerted much influence on the band movement proper. It was towards the end of the nineteenth century that the essential elements of the brass band were established. A typical band then comprised a group of amateur, artisan brass players, plus percussion, directed by a professional conductor. There is evidence that the first two working-men’s bands were formed in the 1830s, in Yorkshire and Wales, and they were to be the forerunners of more than forty thousand amateur bands which were established in the United Kingdom by the beginning of the twentieth century. Indeed, in the area between the Trent and the Tweed, brass band contests were to earn a place similar to that of football matches in the affections of the populace. But band contests were popular not only in the north, they were also organized on a grand scale at London’s Crystal Palace from 1860. The performances of the massed bands at that venue are reputed to have been so overpowering as to cause ladies in the audience to retire from the proceedings. Such contests did much to establish the reputation of many fine bands whose precision of ensemble and technique came as a great surprise to those who had previously heard only ill-trained bands in a village street. An additional surprise to many was the repertoire played, including as it did music of the great masters expertly transcribed. A less savoury aspect of the use of bands could at times be noted at political elections when opposing parties employed bands to ‘drum up’ support. Ensuing rivalries often led to civil disorder during which the bands’ instruments suffered considerable damage. John Ireland was born in Cheshire in 1879 and died in Sussex in 1962. He wrote over eighty songs, many of real distinction such as The Holy Boy here recorded in the transcription by David Cameron. It epitomizes Ireland’s craft in using small-scale but memorable musical ideas to great effect. Particularly attractive aspects of Ireland’s personal style are the lucid economy of his writing and his well-respected abilities as an orchestrator. A Downland Suite was composed in 1932. Its style is simple and direct, showing both a sympathy for the medium and the composer’s remarkable understanding of musical form. The Prelude’s contrasting solo and tutti passages and strong rhythms are appropriately followed by a tender and expressive Elegy whose long-stranded melody is tellingly harmonized and idiomatically scored. The succeeding Minuet has much of the grace and flowing counterpoint of its classical models and is written with such art as to bring a smile unbidden to the listener’s lips. Attractive and bright, the concluding Rondo ends this delightful suite with a flourish, following a penultimate passage of broad and apt sentiment. The Comedy Overture was completed two years after A Downland Suite, in 1934. Subsequently scored for orchestra it became known to a wider audience as A London Overture. Both share the memorable main subject which Ireland based on the call of a London bus conductor intoning ‘Piccadilly … Piccadilly’. The work shows the robust sense of humour present elsewhere in Ireland’s music, and begins, surprisingly, with a lengthy Andante moderato introduction of somewhat enigmatic, almost mysterious character. The main thrust of the overture is carried forward by the brilliantly scored Allegro moderato brillante which contains well-contrasted Tranquillo sections and ends with a suitably rumbustious Vivace. One of the leaders of the English musical renaissance of the twentieth century, Ralph Vaughan Williams lived a long life of great productivity. His work on behalf of English folksong was of great service to the nation and his belief that a composer should ‘make his art an expression of the whole life of the community’ may have surprised those who considered him very much his ‘own man’. There is indeed much that is paradoxical about this grand old man of English music, but there is no doubt about his musical integrity and achievement. Even though he wrote little for band there is no gainsaying the great musician’s imposing authority in the Prelude on Three Welsh Hymn Tunes of 1954 which followed an earlier organ work based on similar material. The three hymn tunes—Ebenezer, Calfaria and Hyfrydol—are cleverly united in a masterly texture that is entirely characteristic of Vaughan Williams, with its well-built contrasts and superbly judged tempo changes. It is hardly surprising that this work has enjoyed much popularity as a music festival piece. Some fifty years before he came to write the Severn Suite Edward Elgar first became professionally involved with band music when he was appointed director of the band of the county lunatic asylum at Powick in Worcestershire. It was in this position that he made arrangements of opera arias and composed some original material for band. The Severn Suite came to be written at the instigation of a brass band music editor, Herbert Whiteley, whose ambition it had been for some time to secure from Elgar a competition piece for the annual Brass Band Festival at Crystal Palace. In 1930 there fell the twenty-fifth anniversary of this festival and Elgar was enticed, with a generous offer made in somewhat hard times, to fulfil this commission. 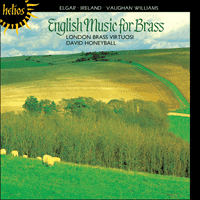 The music he wrote was scored for brass band by Henry Geehl, an acknowledged expert in this particular skill. The arranger recalls that Elgar supplied him with a sketchy piano part, a figured bass and a kind of skeletal orchestral score, together with an indication of the counterpoint that he was required to add. Geehl went on to complain that he had much difficulty in persuading the great composer to write idiomatically for band. However, the work was successfully completed and Elgar accorded it an opus number, 87, and dedicated it to George Bernard Shaw who received the honour with delight. Later, Elgar scored the work for orchestra and added names of local reference to each movement: Introduction (Worcester Castle), Toccata (Tournament), Fugue (Cathedral) and Minuet (Commandery). This new version was recorded by Elgar with the London Symphony Orchestra in April 1932.